When my husband and I were planning out our time in Boston, we knew we were going to need to find a couple of restaurants to eat at. My husband came to me with two different restaurants that he had found, in areas we could get to easily, that both sounded good. We ultimately choose Mistral for brunch because they actually served brunch, whereas my husband’s second option was a dinner-only spot. So that kind of made the decision for us. Unbeknownst to us, it turns out that both Mistral and our dinner restaurant are both part of the same restaurant group and have the same ownership. That explains why both restaurants have great reputations and are pretty similar in feel and design. As much as we enjoyed Mistral, this dinner selection was sure to be a winner. Ostra was designed as a contemporary Mediterranean seafood restaurant that specialized in local and European seafood with light preparation that highlights the flavor and quality of the seafood. Located in the popular Back Bay neighborhood of Boston, Ostra is within a stone’s throw of Boston Public Gardens in a very desirable part of town. Designed with a sleek sophistication and contemporary feel where less is more, Chef and owner Jamie Mammano and Executive Chef Mitchell Randall have created an inviting, beautiful space serving up some of the freshest and best seafood to rival any restaurant in the world. The restaurant features a lounge with a live piano player, a bar, and a large open dining room. Tall ceilings, bright white space with minimal design all add to the feeling of openness and airiness. As you walk into the dining area, you’re greeted by a fresh seafood display that fronts a bustling open kitchen. Packed in ice are various kinds of fresh fish and oysters. 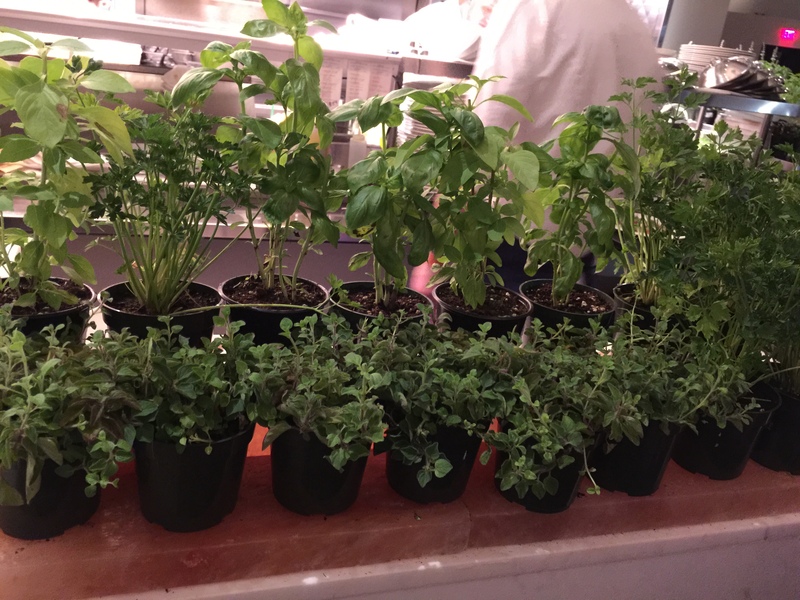 Next to the seafood display is a small display of potted fresh herbs which the kitchen uses in the various dishes that are prepared. This all conveys a sense of freshness and quality to the food we’re about to dine on. My husband decided to order his current go-to drink of an Old Fashioned with a request to use Bulleit rye whiskey for the Old Fashioned. My husband really likes the taste of the Bulleit rye and he said that Ostra certainly didn’t skimp on the alcohol as you could definitely taste it in the drink. 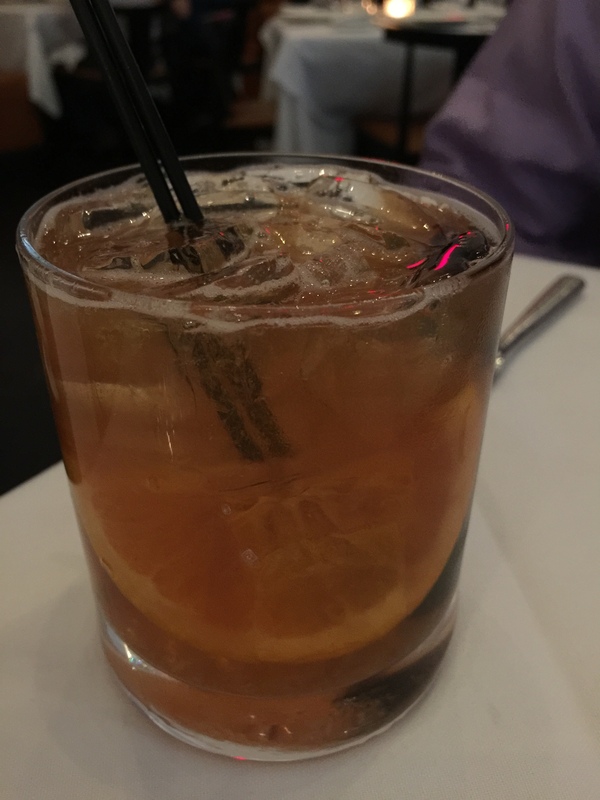 This Old Fashioned, unlike others that I’ve seen him order, actually came with an orange wedge in it rather than just orange rind. I guess this adds just a touch more of the citrus flavor. My husband definitely liked the Old Fashioned, and appreciated the extra kick of good quality liquor. Ostra’s menu was filled with all sorts of fresh seafood options for a starter. There was a selection of oysters from Massachusetts to Maine to British Columbia. There was a large selection of raw seafood dishes and finally cooked and chilled shrimp cocktail. My husband was nice enough to let me choose a dish from the seafood starters for us to share. I realized later, that was because he had his eye on another dish. But we’ll get to that in a bit. There were so many great selections from the raw seafood menu that I had a hard time choosing. 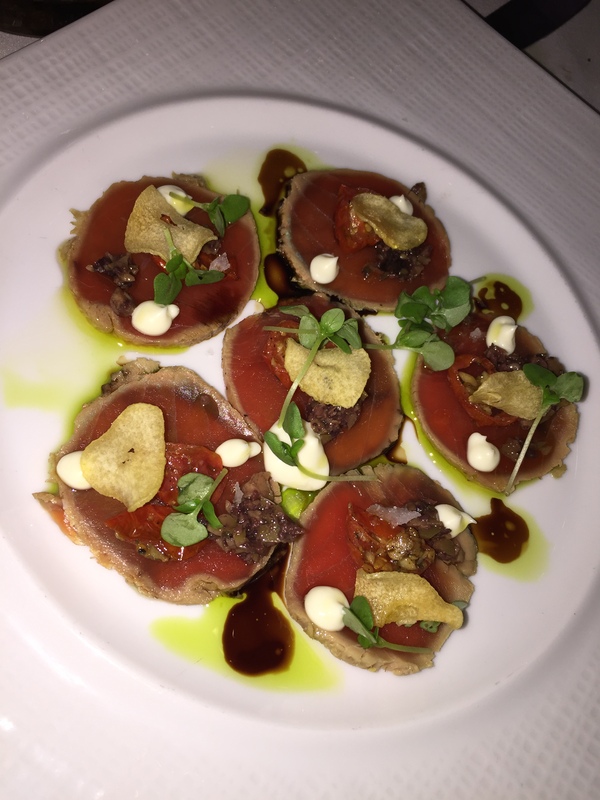 But I finally settled on the yellowfin tuna carpaccio. Served with cured cherry tomato, aged balsamic, black olive, sweet garlic aioli and micro basil, this dish was out of this world. I could not believe how delicious this dish was. The tuna was melt-in your-mouth fantastic. Everything was so flavorful with a little tang from the aged balsamic, a little creaminess from the sweet garlic aioli, a little acidity and sweetness from the cured cherry tomato and some crunch and cool from the micro basil. Admittedly, I don’t love olives, so I tried to ignore the chopped black olive on the dish. But the real star of this dish is the yellowfin tuna. It was like butter on my tongue, so fresh and flavorful and beyond belief. My husband, who isn’t the biggest fan of raw fish even said that it was way better than he expected it to be. I could have eaten 2 plates of this and been happy for the rest of the night. If raw oysters and shrimp cocktail and raw seafood isn’t your thing, Ostra also offers a selection of other starters including cooked seafood, salads, and pasta. Unknown to me, my husband was eyeing something on that part of the menu that he really wanted to try. Our waitress realized that we would be sharing this dish, and since it’s usually served in a bowl and not really a family-style dish, she had the kitchen split the starter into two bowls so that we could each try the ricotta gnochetti. My husband had no idea what this was, but figured hand made gnochetti, which is basically baby gnocchi, filled with ricotta cheese, it couldn’t be a bad thing. Add to that, it was served with Maine lobster, beech mushrooms and shaved black truffle. 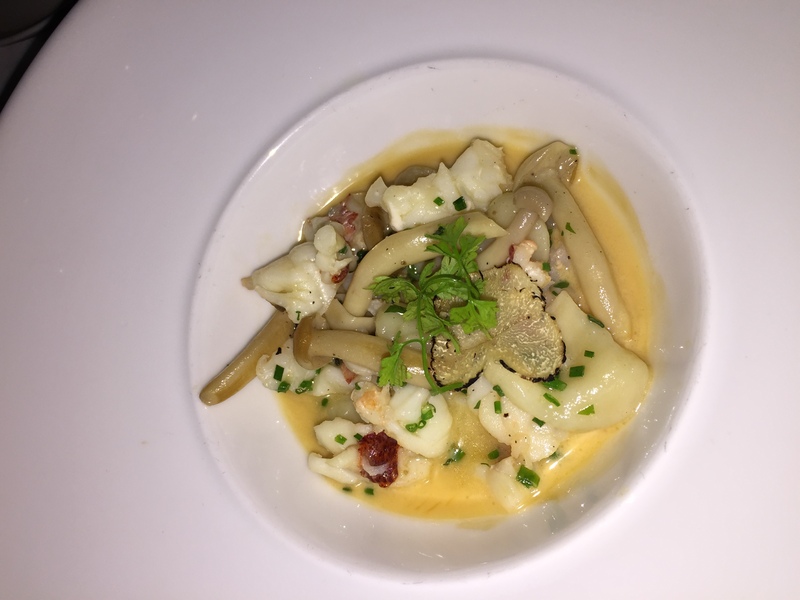 After reading the description in the menu, I should have known that my husband couldn’t resist something like this; cheese, lobster, truffle, this is right up his alley. First off, I’ll admit that I was a bit skeptical about this dish. When they brought it out in two separate bowls for us, I was thinking that they could have just brought out one bowl because I probably wouldn’t eat that much of this dish. But I figured, if anything what I didn’t eat, I could just give my husband my bowl. However, after one taste, I was hooked and probably could have finished an entire order on my own rather than splitting with my husband. First off, the broth that the gnochetti was cooked in was phenomenal, so rich and flavorful and absolutely delicious. There was so much tender, delicious, buttery lobster meat in the dish it was more like I was eating a lobster soup rather than a pasta dish. This was 180 degrees different from anything I thought it would be when I read the menu. It was so insanely good, and I didn’t even really mind the mushrooms in the dish, that I could have just kept on eating and eating. It was really the broth that tied the whole dish together and was the standout star of the dish. I’ve never tasted broth as good as the broth used in this gnochetti dish. I’m so incredibly happy that my husband ordered this dish or else I’d never have known what I was missing out on. I couldn’t stop eating this. For our entrees, my husband stuck with the seafood theme and ordered the grilled branzino filet. Made with salt cured lemon, garlic & herb baste and served with roasted potatoes, Visalia onion and radish, my husband loved it. The branzino was such a generous portion and it was perfectly grilled so that the fish meat was light and flaky, but it had that nice char flavor and grill marks on the outside. The garlic & herb baste with the tang from the salt cured lemon created a wonderfully flavorful fish. Served along side the greens and the radish and potatoes and the onions, my husband really enjoyed the accompanying vegetables to this dish. They too were quite flavorful and paired so well with the light fish. The dish was a generous portion of fish that the dish was filling and satisfying. The dish looked appealing, smelled amazing, and tasted even better. 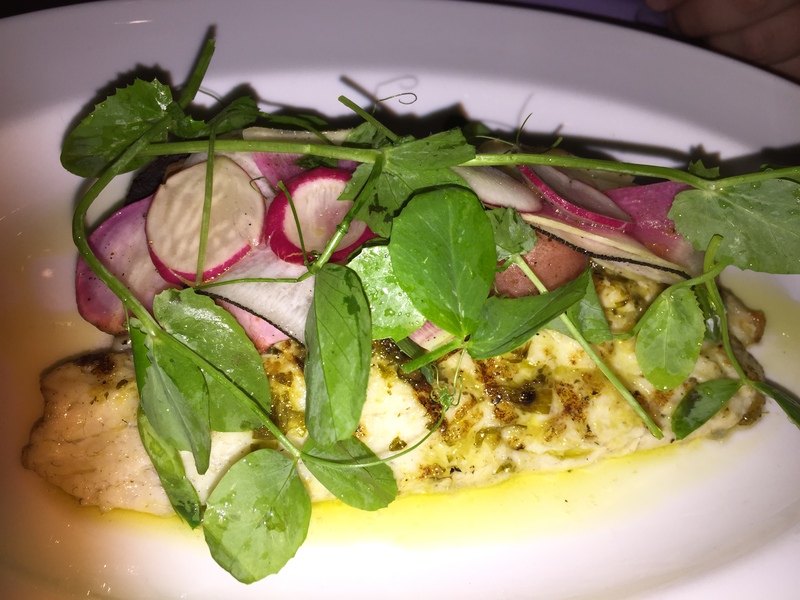 My husband said he couldn’t have asked for a better tasting, better prepared branzino dish and this was exactly what he was looking for when he decided to order the branzino. I know this is a Mediterranean seafood place, but for me, it was the meat on the menu that really caught my eye. So, instead of ordering seafood, I ordered a steak. 6 oz. grilled filet mignon served with maitre d’hotel butter, vin cotton sauce and pommes puree, roasted shallot and mushrooms on the side was my meat of choice. First off, this 6 oz filet sure looked and felt much larger than a 6 oz, but who am I to complain? 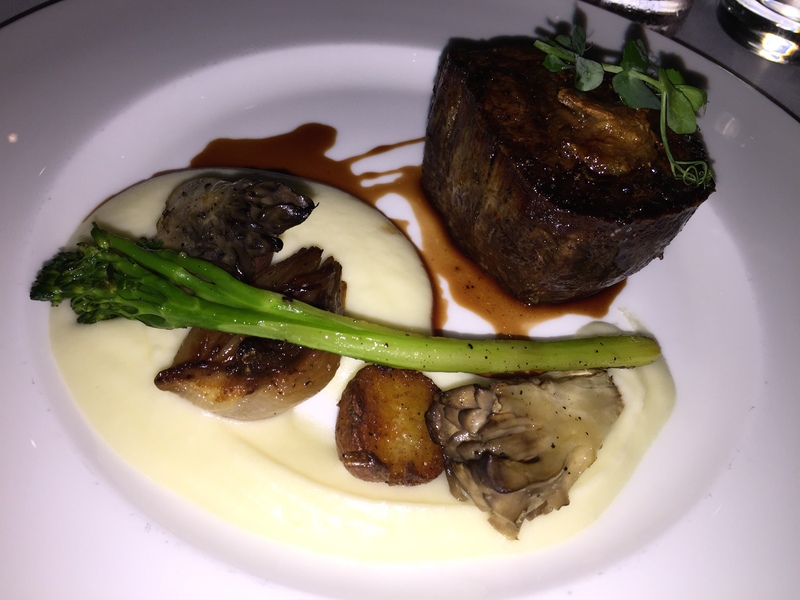 The filet had awesome flavors, it was incredibly tender and the maitre d’hotel butter added richness and creaminess. The vin cotton sauce add depth of flavor to the beautiful meat and some acidity. The pommes puree, which is just a fancy way of say mashed potatoes, was outstanding. The roasted shallots and even the grilled broccolini were just perfect. But the puree itself was out of this world, some of the best mashed potatoes I’ve ever had. Meat and potatoes is what I love, and this was darn good meat and potatoes, everything perfectly cooked and the flavors were just outstanding. I’m so glad I opted to go with the filet for my dinner entrée. At this point, while we had both consumed a lot of food, the preparation, timing and serving size of the food didn’t make us feel like we were stuffed or full. We definitely wanted to give dessert a try. And we were both really liking the atmosphere of this restaurant that we wanted to just enjoy a nice dinner out for a little bit longer. 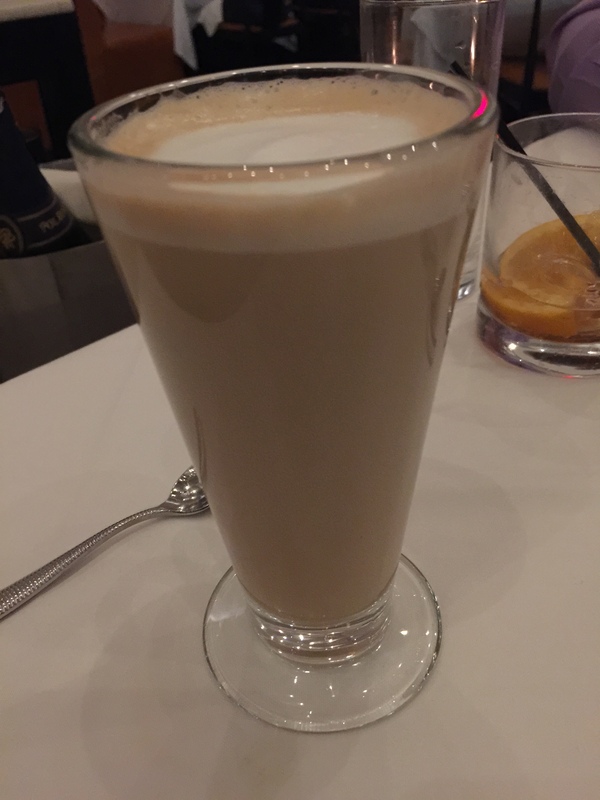 So, I couldn’t help but order an after dinner latte to drink. This one was made just to my liking with the right amount of espresso and a good amount of steamed milk so I got the rich flavor of both. Some people enjoy a cappuccino as an after dinner drink, others espressos, some people just want coffee, I want a latte. Originally my husband and I were thinking of splitting a dessert, but once we saw the dessert menu, we figured out pretty quickly that we were both interested in different dessert items, so we each decided to get our own dessert. For me, I ordered the strawberry verrine. I’m a fan of strawberries and this sounded both interesting and complicated enough to pique my interest. 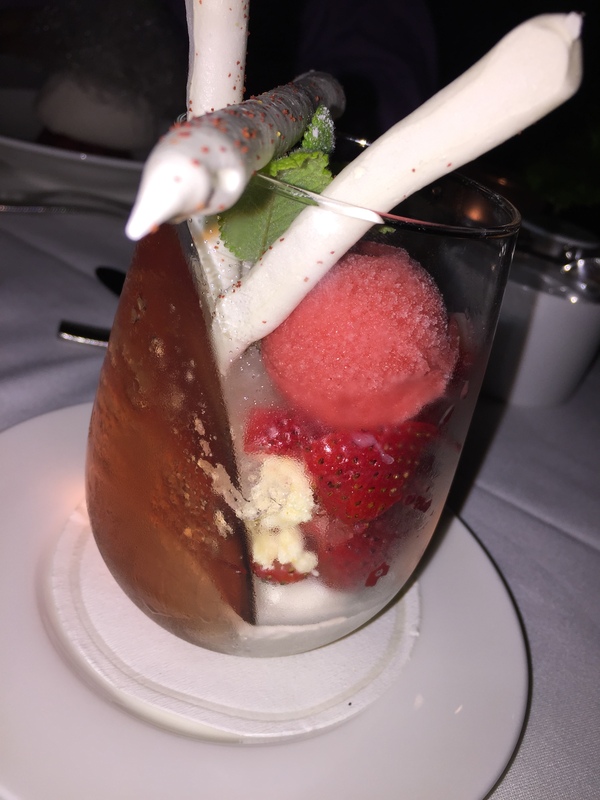 According to the menu, it contained native strawberries, rose-strawberry gelee, shortcake, white chocolate mousse, vanilla bean ice cream and elderberry granita. Talk about a lot of different components in one dessert, but amazingly, each individual component was fantastic on its own, but together it made a really delicious, outstanding and cohesive dessert. Native strawberries are locally grown, fresh strawberries in season – I guess I’d never heard that term before. For the dessert, the strawberries were quartered and combined in the bottom of this beautiful glass that the dessert was served in. The rose-strawberry gelee was allowed to set on a diagonal inside the glass creating a very interesting artistic effect. But this also helped to assure that every spoonful of the strawberry verrine you got out of the glass contained a little bit of this strawberry gelee. The flavors of the gelee were perfect, lightly scented with rose water and a very subtle flavor of strawberry, it had a hint of sweetness without being overpowering to the rest of the dish. The shortcake was at the bottom of the glass with the fresh strawberry atop it, almost reminiscent of strawberry shortcake. The shortcake added depth and volume to the dessert. The white chocolate mousse was almost like little crumbles of white chocolate that was atop the strawberries and the shortcake. Terrific sweetness to the white chocolate mousse, but in small crumbles, it wasn’t overwhelming and didn’t take away from the other flavors. Using both vanilla bean ice cream and elderberry granita was a great contrast in flavors and textures, but yet both were very complimentary to one another. The dessert was so complex that each and every single bite was different depending on what components ended up on the spoon. The finishing touch with the meringue straws was just so creative and unique and added an artistic quality. Bottom line, the dessert was both beautiful and delicious. One of the most unique desserts I’ve ever had, and definitely the essence of strawberry in every bite. My husband chose a dessert called the Snow Egg. I’m not sure he knew exactly what he was ordering when he did, other than the fact that the name snow egg sounded interesting. Even the menu description doesn’t accurately describe the concoction brought to the table. 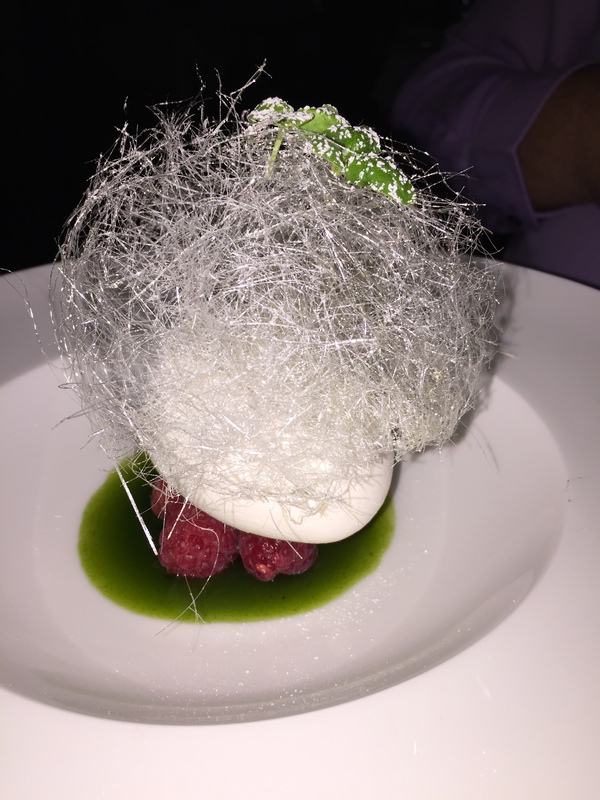 According to Ostra’s dessert menu, a snow egg contains meringue, lemon curd mousse, raspberry and basil. The creation that landed on the table fits the name snow egg, but beyond that, it was so different and unique my husband didn’t quite know what to expect on the first bite. What you get is a green liquid gel thing at the bottom of the bowl which we assumed was the basil. Sitting in this basil soup were some fresh raspberries. Atop that was a meringue and we assumed somewhere in there was the lemon curd mousse. Then atop the whole thing was this silky “nest” thing that looked gorgeous and almost too delicate to eat. Finally, there was a garnish of some fresh basil leaves dusted with powdered sugar. My husband took one bite of his dessert and a huge smile came across his face. He immediately told me I needed to try it, which meant that it was delicious and he knew I’d like it too. The flavor of the basil soup was amazing, sweet, but not too herby. It made the whole entire dessert, in my opinion. I wouldn’t have suspected that basil looking like that would be that good, but it was a standout. The combination of the sweet touch to the basil with the raspberry and lemon and the sweetness of the meringue and sugary silky nest all worked in perfect combination together. This is one of those desserts where everything just comes together – presentation is lovely, the flavors combine perfectly, the textures compliment each other really well – that you just can’t find any flaws with it. My husband thought his dessert was awesome and was glad that we each chose our own dessert because trying to choose between one of our two desserts would have been really difficult and we would have missed out an amazing finish to our meal. But, our meal wasn’t done yet. At the very end, compliments of the chef, we were presented with a couple of dark chocolate and caramel truffles. A sweet ending to a beautiful meal. 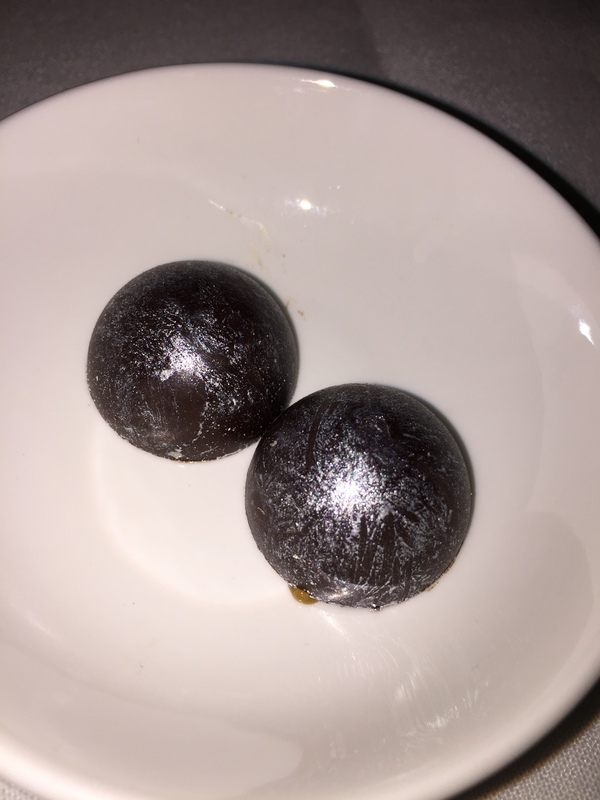 These half dome chocolate truffles with a shimmering luster were fantastic. The dark chocolate hit the perfect notes of bitterness to compliment the velvety smooth caramel hiding inside. Not too sweet, not too bitter, just the perfect chocolate truffle bite. 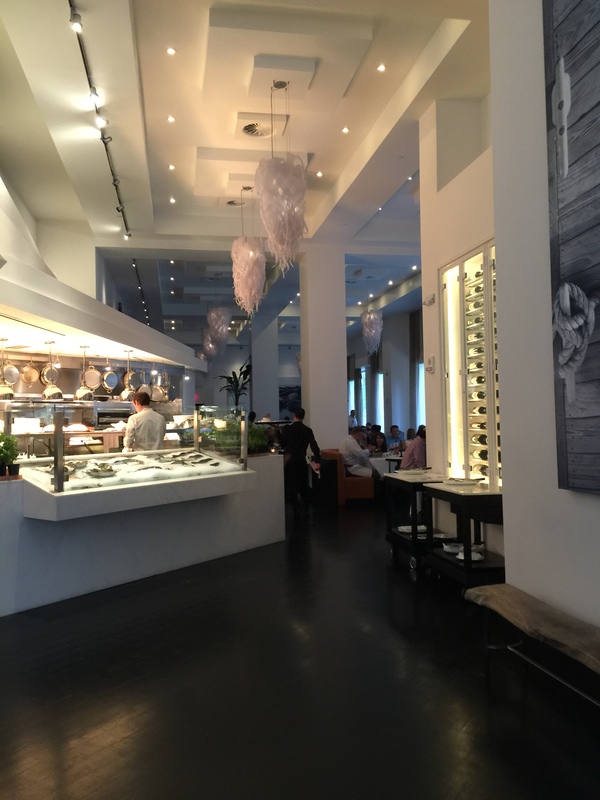 I was thoroughly impressed with every aspect of our meal at Ostra. First off, the service was incredible. Our waitress was knowledgeable, friendly and attentive. We never went without anything during our entire meal and we got the impression that our waitress generally was happy and took a lot of pride in her work and pride in the restaurant itself. When I walked out of the restaurant, my first comment to my husband was that I thought that in taking in the entire package – the restaurant, the atmosphere, the service and the food – this was the best restaurant I had ever dined in up to that moment in time. It’s not that Ostra’s menu was unique and creative and outrageous, they didn’t make food that you can’t find at other nice restaurant, but it’s the way they put it all together that really left an impression on me. The food they did serve, was perfectly cooked and flavored and presented. There wasn’t a misstep in any of the dishes we ordered through the evening’s meal. The seafood was outstanding and every dish came out exactly as advertised and more. Combine the incredible food with the beautiful decor and atmosphere and our outstanding service and it creates a dining experience that is one that I won’t be forgetting any time soon. 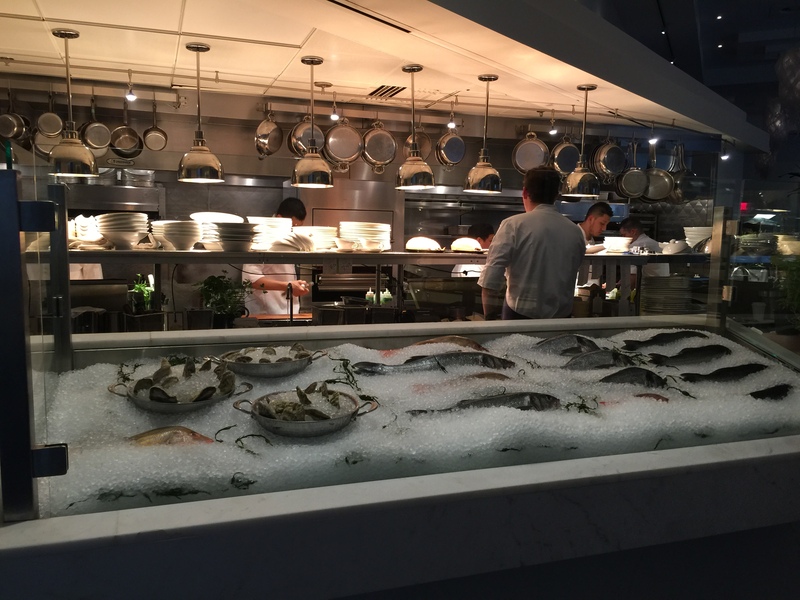 In fact, as soon as we arrived back in Los Angeles, I told my boss, who travels to Boston often and used to live there, that the next time he found himself back in Boston, he had to go dine at Ostra. 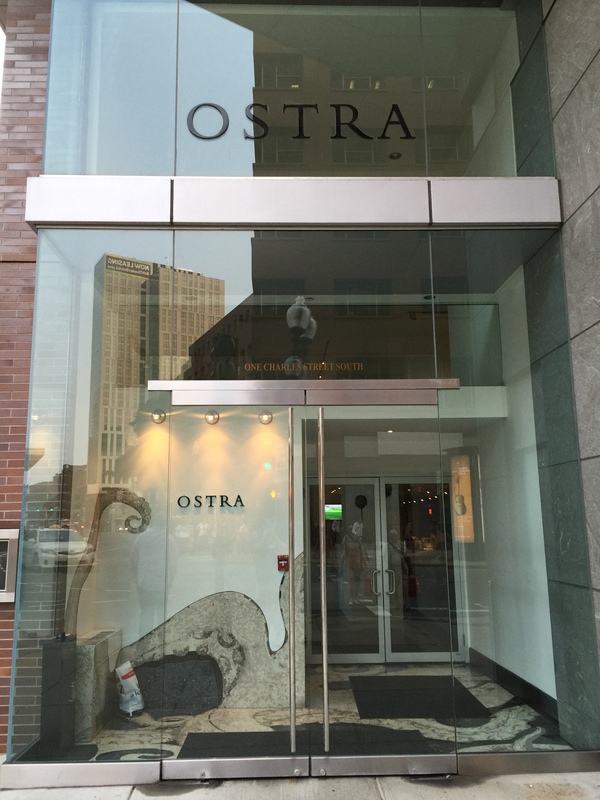 Ostra is a dining experience that I’ll remember for a long time to come. The ricotta lobster gnochetti was top three dishes I’ve ever had. Easily. Your dinner sounds delicious, you couldn’t have picked a better restaurant in Boston to visit.